After reading Michael Bierut’s touching and poignant tribute to Massimo Vignelli on Design Observer today it was hard to imagine writing something meaningful about my brief encounters with such an influential and inspiring designer. Since I’m a photographer I thought I’d try a visual tribute based on my three very memorable days filming and photographing Massimo and Lella. In May of 2009 I began a series of portrait sessions featuring some of the most prominent graphic designers in the United States. 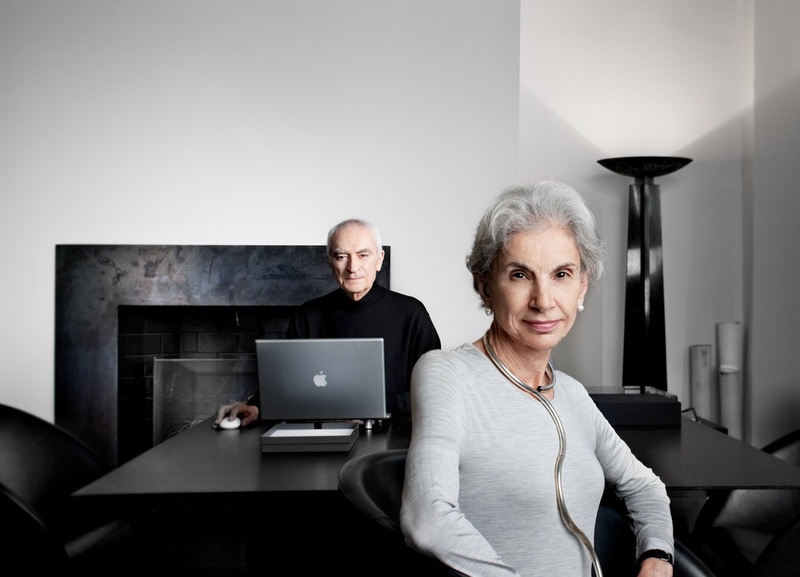 Massimo Vignelli was at the top of my list and I was thrilled when he agreed to let me photograph him and his wife, Lella, as my first subjects. I spent the better part of a day photographing the two of them in various settings in their design studio on East 67th St. During the session Massimo expressed an interest in my camera. He told me he had always had a fascination with camera design and lamented the fact that he had never had the opportunity to design one himself. In a wonderful demonstration of his divergent interests and talent he made a quick sketch depicting the evolution of 35mm cameras, signed it, and handed it to me. I still have that sketch along with a signed poster of his famous and controversial subway map redesign. The following year I was inspired to shoot a short documentary about Massimo. He very graciously allowed me to film him despite the fact that this was my first attempt at filmmaking. Over the course of two sweltering summer days in his un air-conditioned studio my assistant and I were ready to faint in the heat but Massimo never broke a sweat in his signature black turtleneck. Below is the resulting seven minute video which Massimo told me was the best film done on him to date. I’ve also included a few photographs from my original still portrait session. My favorite frame from the 2009 portrait session with Massimo and Lella. Massimo’s sketch depicting the evolution of 35mm camera design. Massimo in his design studio with a enormous Roy Lichtenstein tapestry and a bust of Goethe, whom Massimo revered. Massimo working with one of his designers at the incredibly uncluttered desk where he did much of his design.